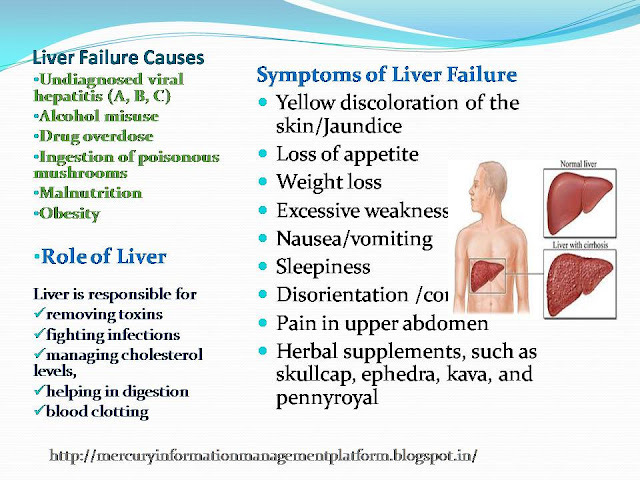 This article is about liver disease, liver failure causes, liver failure symptoms, and liver failure treatment. Liver is one of the most critical organs of human body. It won't be wrong to say that liver health determines how healthy you are. Just like your heart, your liver must function properly for a healthy body!! Of late, there have been numerous reports about people suffering liver failure. How does a liver fail? What are the symptoms? Two years back, we experienced one of the most distressing times in our family, as the youngest member from my husband's family suffered liver problem. The day is still fresh in my memory - the boy was just a 12 year old then. It all started with a feast in a 5-star hotel, where the boy savored tandoori chicken. Probably the infection started from there. A couple of days later, he started experiencing abdominal pain, vomiting, diarrhea, and fever. He was admitted to one of the most prestigious hospitals in the state of Odisha. Blood & lab reports showed infection. The hospital kept him only on medications, without administering any dietary fluids. His health started deteriorating to the extent that the doctor told parents of the boy that his liver was failing. His bilirubin level had reached 40 and was only going higher. The next diagnosis was that the boy was suffering from hepatitis B. To the parents' surprise, they had brought their son to the hospital to see him recover. Unfortunately, the lackadaisical attitude of the hospital staff and their misdiagnosis of the boy's condition brought him to a serious condition. He had become too weak. After three days, the doctor told the boy's parents that their son needed a LIVER TRANSPLANT. The boy was airlifted to Hyderabad's Global Hospital for a transplant. Fortunately, the doctors at the Hyderabad hospital saved the life of this young boy. They were surprised that the hospital where the boy was admitted earlier had done a misdiagnosis of his condition. They said the liver was doing well and there was no need for a transplant. They administered nutritional and medication therapy and the boy was discharged within 3 days. Recovery did take him almost a year, with monthly follow-ups with the doctor and a strict dietary regimen. This young boy is completely fit now and aspires to become a doctor - just like the one who had saved his life! · produces proteins, such as those that help in blood clotting. The very mention of “hepatitis and jaundice” reminds us of liver. These are two common kinds of liver diseases, which could be caused by drug addiction, alcohol intoxication, and consumption of unhealthy foods. The term fatty liver is widely heard these days. Ever wondered what it implies? Also known as steatosis, fatty liver is a condition characterized by improper fat metabolism in liver. Though some fat in the liver is normal, fatty liver occurs when the amount of fat increases by 5-10% of the organ's weight. Alcoholics are more likely to have a fatty liver. However, there is nonalcoholic fatty liver disease as well. Some women may get a fatty liver during pregnancy. The condition is more likely to affect middle-aged people, especially those who are overweight or obese. However, you may be surprised to find that steatosis may also affect those with malnutrition. Too much alcohol consumption forces the liver to metabolize alcohol. As a result, the organ metabolizes less amount of fat, which then deposits on the liver. For some alcohol addicts, fat forms large vacuoles within the liver cells, thus damaging cells and severely affecting liver health. Damaged liver cells are unable to function properly. The condition could cause formation of fatty cysts and irreversible lesions. A healthy diet plan, with a focus on balanced & healthy eating and frequent cardio exercise, can help reverse fatty liver disease. A diet low in saturated fats, trans fats, and cholesterol is generally recommended for people with steotosis. Olive oil is often suggested as a healthy substitute to other types of oil. In severe cases, the liver may get larger. Some people with prolonged fatty liver may get cirrhosis – or scarring of the liver tissue. Cirrhosis can be a fatal condition and requires immediate medical attention. Liver disease or poor liver health can affect food absorption and production of proteins in the organ. Blood tests – Blood work will reveal if there are a high number of certain enzymes in the liver that could cause fat deposition on the organ. Ultrasound – The doctor uses sound waves or sonography to see an internal picture of the liver. MRI/Cat scan - The doctor requires MRI or cat-scan reports to get further images of the organ. Biopsy – In some cases, the doctor may need to insert a needle to take out a tiny piece of liver to look for signs of damaged liver tissue and cells, fat, or inflammation. How does malnutrition cause fatty liver disease? When I read about malnutrition being one of the causes of fatty liver, I was really surprised. Let’s see how malnutrition affects liver health and triggers this condition. Though fatty liver sounds more like related to too much fat, it will not help to eliminate all fats from your diet. How? In a malnourished person, the body is not able to derive enough energy from food. As a result, it shifts its focus to fat and protein stored elsewhere. The fat and protein are then moved to the liver for storage, so that the organ can convert it into energy. This surely is a word of caution for those on strict diets. Most dieting women develop fatty liver. Generally, fat accounts for 3-4 percent of the total weight of liver. But when it increases to 5 percent or more, your liver health is compromised. Early diagnosis and treatment can help reverse a fatty liver. On the other hand, without medical & dietary intervention, steatosis can turn into cirrhosis, fibrosis, or even cancer. Your liver health is utmost important for a healthy body, because it is your liver that processes all foods and drinks and filters toxins from the blood. The liver has a miraculous way to repair itself. It rebuilds and regenerates new cells when the old liver cells are damaged. Repeated damage or poor eating habits, a sedentary lifestyle can cause permanent scarring or cirrhosis. Eat a balanced diet and get yourself moving with a strict exercise regimen. If you are obese or overweight, your first target should be to lose weight. Set small weight loss goals per week and do everything you can to realize them. It would help to limit intake of high carbohydrate foods, including rice, bread, potatoes, corn, and grit. You would want to curb your consumption of carbonated beverages, diet & soda drinks,sport drinks, and refined juices to promote liver health. As the name suggests, it is a condition in which there is rapid loss of liver function, probably within days or weeks. In most cases, the condition affects a person who has no reported signs of pre-existing liver disease. Contrarily, chronic liver failure is a slow process and develops slowly. 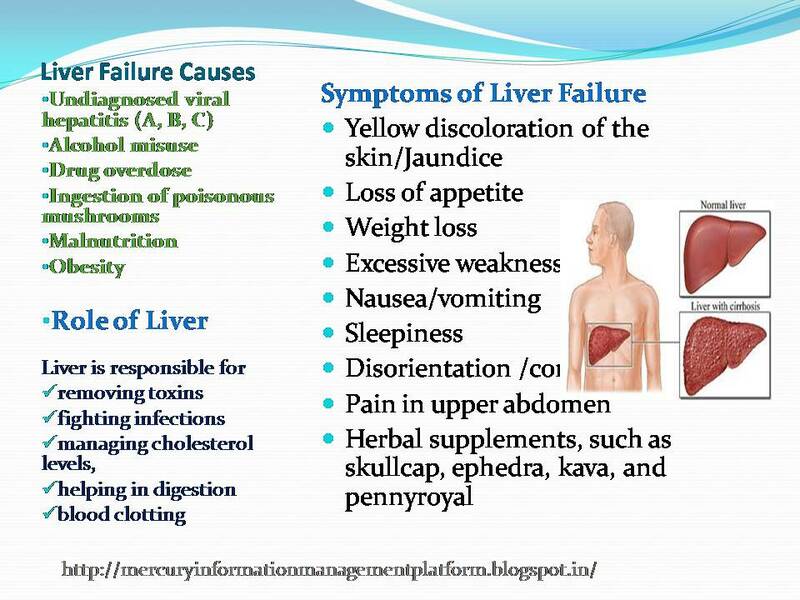 Fulminant hepatic failure or acute liver failure can cause fatal complications. This includes sudden and increased pressure in the brain and excessive bleeding. See your doctor immediately in such situations. A liver transplant seems to be the only cure for acute liver failure. Drug overdose: Over-the-counter medications, such as acetaminophen, tyenol, paracetamol, antibiotics, anti-inflammatory drugs, and anticonvulsants, can cause acute liver failure. Drug overdose is the most common cause of liver disease in the United States. If you take a higher than recommended dosage of the medication for several days, you could be at the risk of acute liver failure. Seek medical attention immediately. Herbal supplements: Certain natural drugs and supplements, such as kava, pennyroyal, can cause acute liver failure. This does not mean dietary supplements are safe. Certain dietary or health supplements are linked to severe liver injury. Recently, there have been reports of people developing liver damage after consumption of a weight loss supplement, known as Lipokinetix®. Some common symptoms of liver failure from herbal supplements include loss of appetite, acute hepatitis, tiredness, and abdominal pain. In the case of herbal supplement kava, the higher the dose, the grave the risk to liver. Autoimmune disease: can cause liver failure. The immune system starts to attack liver cells, resulting in injury and inflammation. Metabolic disease: In some cases acute fatty liver during pregnancy can end up in liver failure. Rare metabolic diseases may also be linked to acute liver failure. 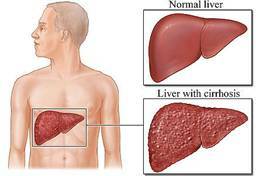 Liver Cancer can cause liver failure. Blood tests, imaging tests of liver, and liver biopsy are some of the ways to diagnose acute liver failure. Focus on your food intake and eat wisely and do regular workout to keep your liver healthy and boost overall health. This will prevent you from advanced liver disease, fatty liver, liver cancer, or liver cirrhosis.